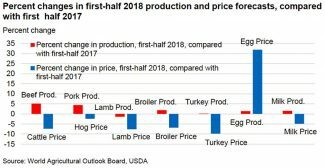 On Dec. 18, the U.S. Department of Agriculture released the most recent first half 2018 price and production forecast for meat, milk and eggs. The summary of the projections is in Figure 1 below. 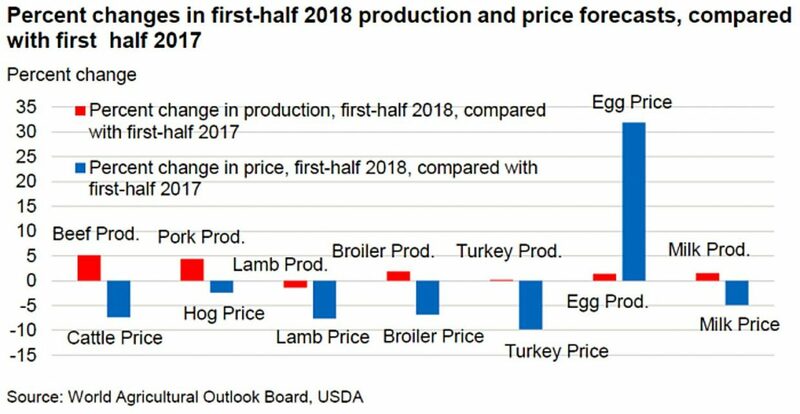 USDA is generally projecting increased meat, milk and egg production for first half 2018. Only lamb production is projected lower due to a smaller 2017 sheep flock in the U.S. 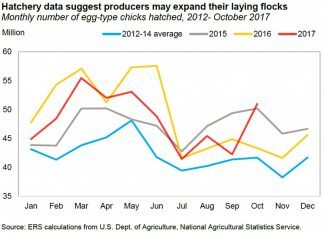 While higher production of livestock and livestock products leads to likely lower prices, USDA is projecting a steep rise in egg prices during early 2018 compared to 2017. Egg prices have been influenced by larger egg exports, up 15 percent during October. Most of the growth has been to Asia. 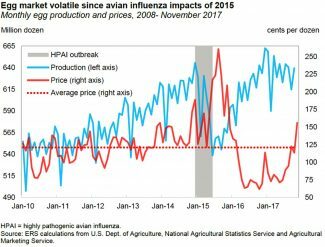 USDA points out that egg prices have reached the highest level since the 2015 and the avian influenza aftermath. 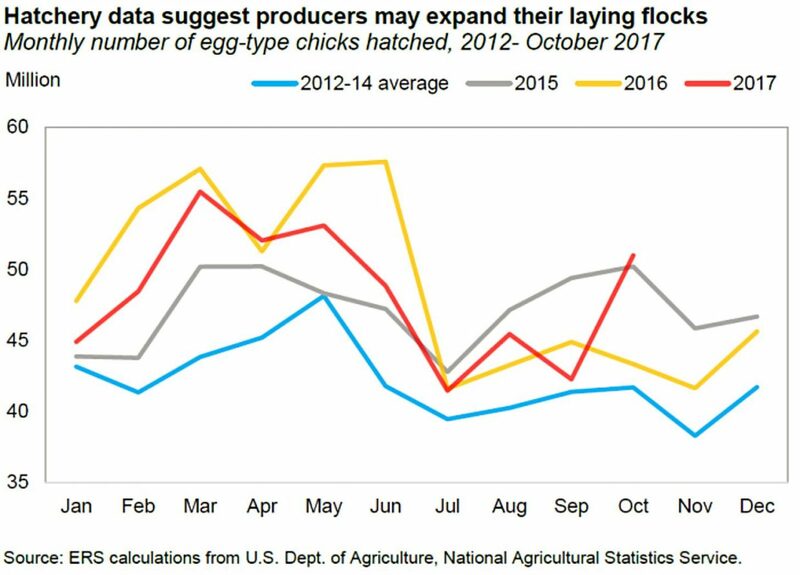 U.S. 2017 per capita intake of egg and egg products, termed disappearance, is 7 percent higher than the 2010-14 average (Figure 2). 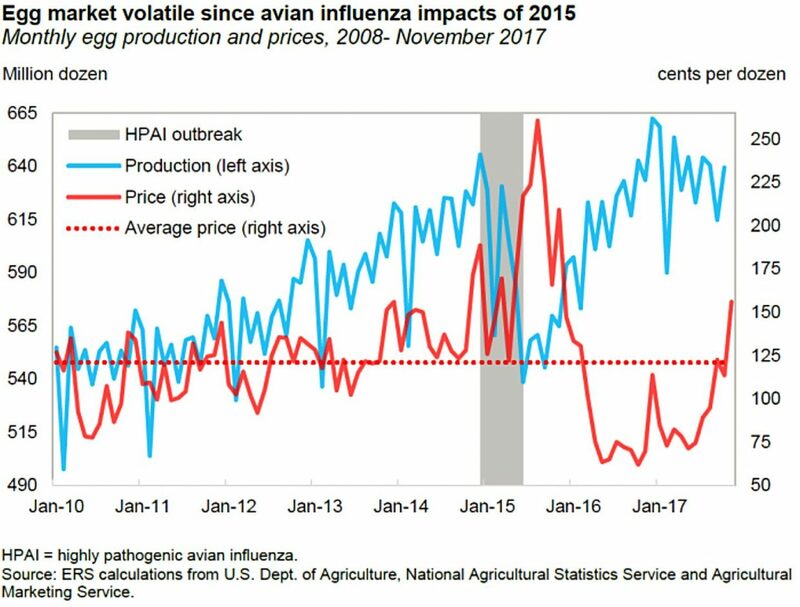 The 2015 avian influenza reduced egg production and profit margins encouraged more egg production during 2016 which then reduced profits from low egg prices (Figure 3). The low egg prices may have encouraged market demand. Dairy product prices are likely to decline during the first six months of 2018 due to increasing stocks of some milk products as well as reduced domestic use of dairy products occurs. Use of all milk products on a milk fat basis is up only 0.6 year over year (YOY) but is -0.3 percednt on a skim solids basis YOY. The most recent Penn State University Dairy Outlook points out the large European dairy supplies as one of the bearish factors in future milk prices. The EU is the largest exporter of milk powder. Last year the EU sold 50 percent more milk power than the U.S. Bob Cropp, Professor Emeritus at the University of Wisconsin Cooperative Extension and Mark Stephenson, director of Dairy Policy Analysis from the University of Wisconsin pointed out last month that both the EU and New Zealand are having stronger milk production years. These two will compete with the U.S. for dairy export markets. 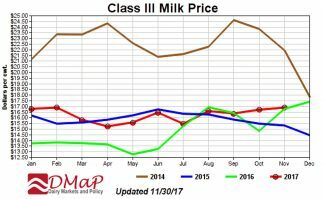 USDA is projecting 2018 Class III milk prices between $15.30 and $16.10. 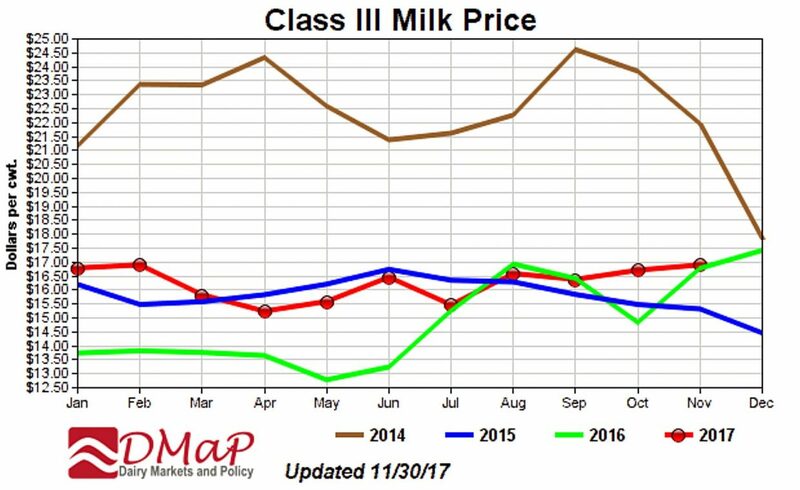 With declining Midwest milk premiums, basis, milk prices in the region are likely be more like 2015 than the past year (Figure 4). There is much more in the Dec. 18 2017 USDA outlook. I have only hit some of the highlights.